Ever wondered what our intensives are like? Have you been curious but not sure if you wanted to commit to taking a full intensive? 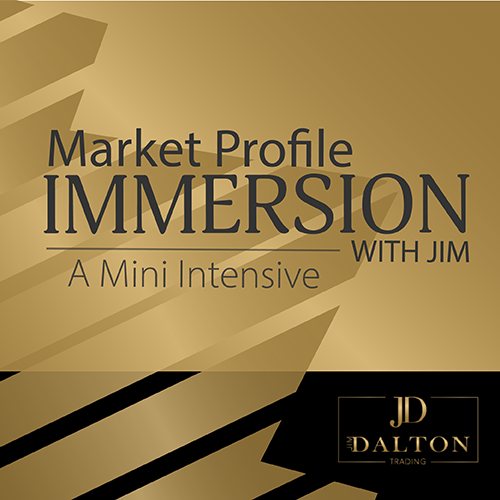 For the first time we are offering the chance to join us for a scaled down version of a full intensive – Market Profile Immersion with Jim: A Mini Intensive. We decided to do this mini intensive to try and bridge the gap for people who know market profile basics and who are curious, but did not want to commit to the time or cost of a full intensive without understanding what we’re about or what we focus on with regards to immersion trading. We will be having a full Intensive starting in February. Details for next year’s full Intensive course will be forthcoming. What is included in this Mini Intensive? Do you do your homework everyday? Our daily reports are a great way to learn Jim’s Top Down Approach and what things you should be including in your own homework and analysis. As a trader, daily preparation is a must to be successful. When we are not in a live webinar, we will provide live commentary throughout the trading day to keep you in touch with the market. Each week we will have 3 morning webinars & 2 afternoon webinars. One of the afternoon webinars each week will be a Review & Replay session and one will be a Last Hour of Trade. During the live webinars we focus on nuances, circumstances, and market context that is so essential to having a trading edge. Webinars are recorded so that you can view them later in case you are not able to attend.